One of the best things about visiting Deep Creek Lake and Lake Pointe Inn is enjoying the breathtaking scenery of our area. Western Maryland has gorgeous rolling hills and foliage that changes beautifully with the seasons (and of course, Deep Creek Lake provides our guests with amazing views no matter the time of year). A popular way to discover all the wonder that our landscape holds is taking a ride on the Western Maryland Scenic Railroad. 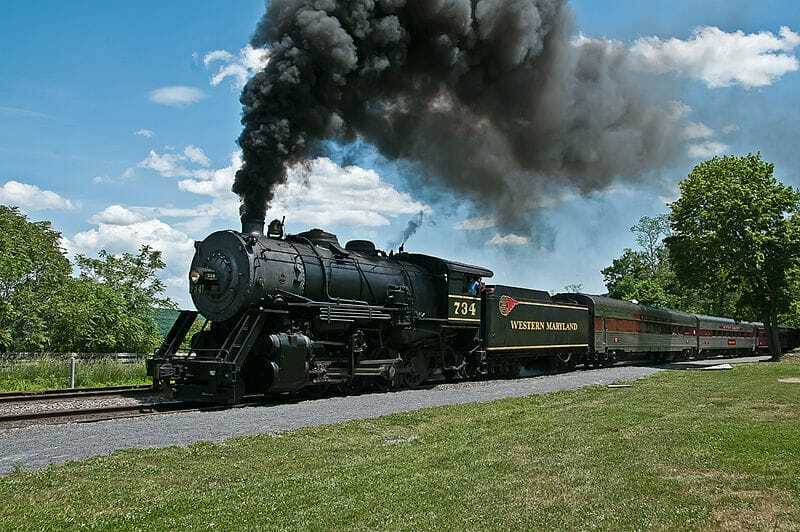 Step aboard one of the locomotives and sit back and enjoy the picturesque Maryland mountains rolling by you as you travel along this heritage railroad. Read on to find our more about the Western Maryland Scenic Railroad and what to expect when you take a ride. The Western Maryland Scenic Railroad is a heritage railroad that uses the tracks of the former Western Maryland Railway line. The railroad utilizes both steam and diesel locomotives to carry passengers from the Station in Cumberland to Frostburg, Maryland and back. Cumberland is just a short 45 minute drive from McHenry, making a ride on the Western Maryland Scenic Railroad the perfect day trip while you’re staying with us. Along with serving as the train depot the former Western Maryland Railway Station at Canal Place in Cumberland has other attractions and activities that will complete your excursion. There are hiking paths through the surrounding wooded areas as part of the Chesapeake & Ohio Canal National Historical Park which also has a visitor center. Canal Place is also home to restaurants, shops, and tour services. While the Western Maryland Station at Canal Place is extremely diverting and worth your time, the main attraction is of course the train ride. The trains depart at 11:30 from Cumberland and travel to Frostburg where there is an hour and a half layover. You can use the time to observe the train on the turntable preparing for the return trip, explore Frostburg’s shops, have some lunch, or visit the Thrasher Carriage Museum (passengers on the railroad get free entry). The coaches on the Western Maryland Scenic Railroad have been restored for your comfort and enjoyment as well as to provide an authentic experience. Most seats are beside large windows that you can use to watch the Maryland Mountain scenery rush by. The route winds through downtown Cumberland, through a cut in the Allegheny Front known as the Narrows, over a bridge in the Narrows, around a 1/2 mile arc known as Helmstetter’s Curve, through Brush Tunnel and Woodcock Hollow before arriving at the Frostburg Depot. The train is also home to a snack shop and a gift shop. Now that you know more about the Western Maryland Scenic Railroad, the best way to start planning your getaway is to book a stay at Lake Pointe Inn on Deep Creek Lake. Our McHenry, MD bed and breakfast is the ideal place to relax and pamper yourself after days of exploring Western Maryland. Our luxurious rooms & suites feature find furnishings, plush towels and linens, gas fireplaces, and private baths. And you’ll always get a delicious gourmet breakfast each morning so you can take on the day’s adventures. See you soon!